Interested in tennis? 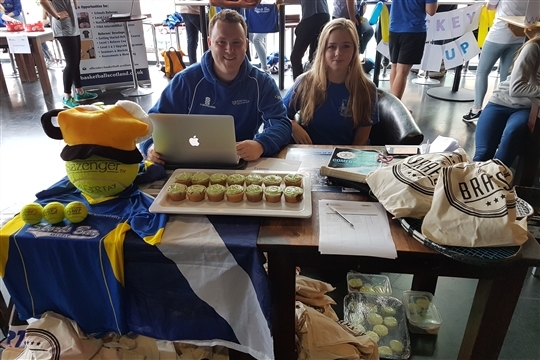 Come see us at sports fayre tomorrow where you can sign up and receive a free Welcome pack to find out about our club and what we're offering you this year! With Dawson park being our new host site, Social tennis kicks off the week on Mondays at 7.30pm-9.30pm, followed by a trip to Braes for a pint to replace those lost fluids on court! Wednesdays will see the BUCS and team challenges fixtures take place this year, so keep your Wednesday afternoons free and come support the guys in their quests to furhter conquer Scotlands student tennis circuit! Friday sees the introduction of our improvers class 5-6pm, which is open and suitable for everyone who is not in BUCS, with the aim being to improve your match skills and knowledge. 6-7pm sees the Mens BUCS squad training and then the girls squad training 7-8pm, so lots happening on the tennis front! All classes are available to book onto at our coaching section of the website, however team training is invitational only so please dont book for this course unless you hear from the committee first. All classes will be delivered by head coach Ross this year, so should you have any questions then please get in touch with him by clicking on the "contact" tab at the tab. All the classes, news bulletins, competition reports etc will go out via our website on a weekly basis so keep an eye out so you dont miss any important details. This is going to be even better than last year, so dont waste time and join us at Abertay's club of the year!